go to the nurses station at the front desk to activate (their registration for the current visit)"
"Those patients who are dead should immediately go to the nurses station at the front desk to animate themselves". [VHM: In colloquial usage "guàle 挂了" could mean something like "kick the bucket", while "jīhuó 激活" could mean something like "(re)animate (their body)", i.e., "come back to life". If that is not a bizarre enough instruction, consider the entire procedure one must go through before getting to see a doctor. 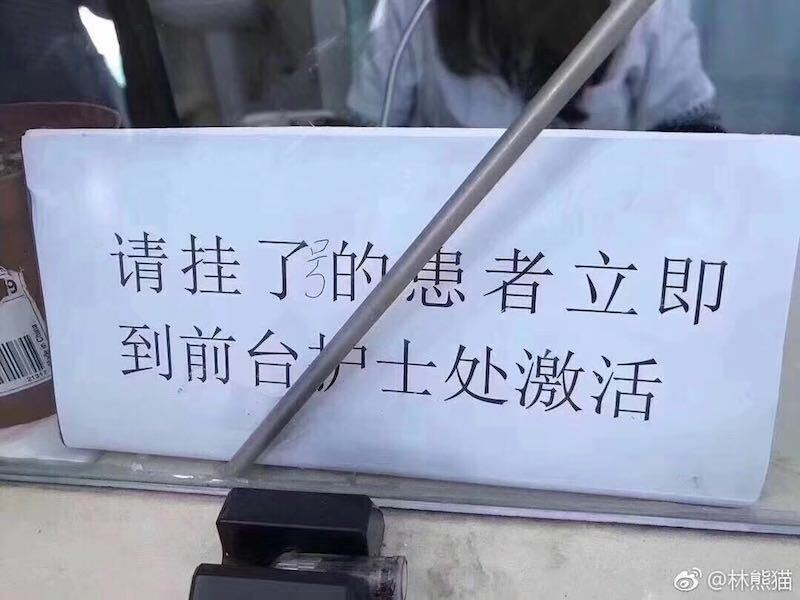 The following placard is from Peking University Third Hospital, one of the best hospitals in China, and it explains what to do before arriving at a doctor's office. First of all, the majority of hospitals in China are state-run, which supposedly ensures that most citizens will be able to afford medications, as well as accessibility to medical resources. Since the Chinese population is huge and there are not enough doctors to cater to the needs of every patient, hospitals strive to maintain efficiency through their complex appointment systems to prevent any waste or inefficiency, such as patients missing their appointments. Next is the appointment procedure unpacking. There are two kinds of patients in the above picture. One are new patients (chūzhěn bìngrén 初诊病人), the other are re-visiting patients (fùzhěn bìngrén 复诊病人). For a new patient, he or she has to hold a patient ID so that his or her profile can be set up within the hospital, and that his or her methods of payment can be settled, while a re-visiting patient can skip this step. To maximize efficiency, the patient can make an online appointment without a patient ID, but after all, they will need to finish this step later. When patients have their ID, they need to proceed to register for themselves at the hospital so as to decide which departments and doctors they want to go and see. Then they will move to the floor where their doctors' offices are located and then to input their registration at the guide desk and get themselves numbered among all those patients who want to see the same department or doctor. This step is a bit puzzling, but very necessary and wise, because there are those who leave after they have registered with the hospital to attend to other matters and consequently they may come back late. However, there are patients in line after them. Thus, if a patient registers and then leaves, he or she may miss the opportunity to make their appointment. Besides, the guide desk will help assign patients to a doctor, and this prevents all the patients from trying to see the same doctor. The fact is that in most hospitals, people can only make appointments within various levels of doctors, not necessarily the best-known physicians, e.g., doctors in charge, or chief physician. They have to wait until they are distributed to a specific doctor to know who will actually look after them. "Jīhuó 激活"("activation") indicates the guide desk step: patients have to activate their registration to have their doctors distributed to them, and they will get a new number which will be displayed on a screen on their floor to indicate how many people are waiting before them so that they can decide whether to go to the restroom or not. What happens after registrations have been activated is going to a doctor. The doctor will tell patients what is wrong and prescribes medicine for them through their patient ID. Patients can hold their ID to go to an automatic pay station or a staff-charging window to pay their bills. If patients are required to have medical examinations, they will need to go to a room whose location should be shown on their bills after their payment. If they simply have to take some medicine, they will go to the hospital's pharmacy to pick up the medicine. All they have to do is to swipe their ID and what has been prescribed for them will be delivered to them at the window of the pharmacy. If there are too many people waiting for medicine, they will have to get a number at this step too. I think some patients might expire before going through all those steps. How old is the usage of 激活 jīhuó to mean activation? It sounds very modern to me. Here the 処would be translated as station, right? Adds to the long list of other translations for this term! "Jīhuó 激活" ("activate") reminds me of this thoroughly modern term, jīguāng 激光 ("laser"), where the first syllable by itself means "excite; stimulate; arouse; incite" and the second syllable means "light". Victor Mair: "jīguāng 激光 ("laser"), where the first syllable by itself means "excite; stimulate; arouse; incite" and the second syllable means "light""
Which meaning ("light stimulator") is now opaque to most English speakers, unaware that "laser" was once the acronym 'Light Amplification by Stimulated Emission of Radiation'. I've sometimes wondered whether the handy "ER" ending was just fortuitous or whether the scientists foresaw its convenience for regular formation of derivatives; e.g. "to lase", "lasering", etc. OP: "If that is not a bizarre enough instruction, consider the entire procedure one must go through before getting to see a doctor." 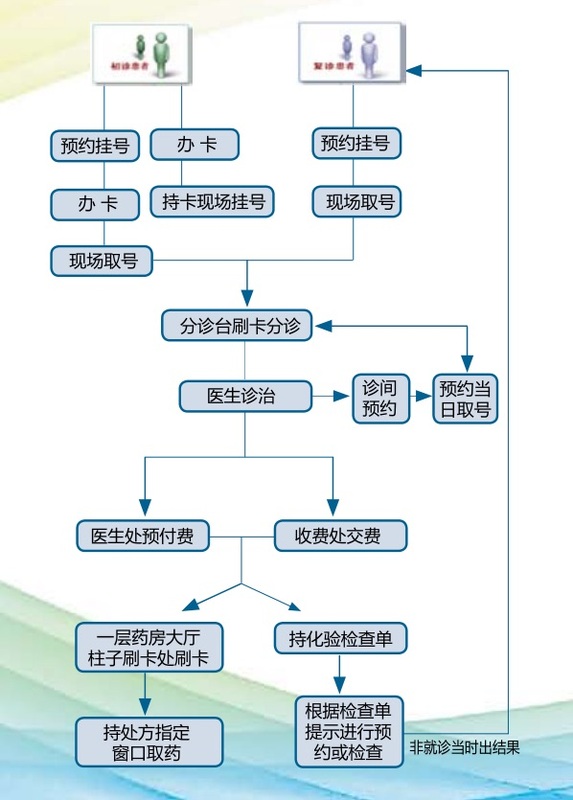 It's not actually that complicated since being treated by a doctor (医生诊治) is actually step 4 (or 5 if you don't already have a hospital card). The first couple of steps are simply registering ahead of time and getting a number once you're at the hospital. The rest of the flow chart includes payment, getting medication, booking follow ups, and booking medical tests. Seems very similar to the procedure here in Japan. Probably necessary when you need to process a lot of people.